14013 8th Battalion Suffolk Regiment. Arthur Bareham was born in Great Cornard around 1880. He was the son of Bowers and Mary Bareham. The family lived in Boundary Cottage, Newton Road, Great Cornard. His father was employed as a general labourer. Prior to Arthur enlisting he was a mat maker; he enlisted in Sudbury and served like his younger brother Percy with the Suffolk Regiment. Arthur served in the same battalion as William Bruce and Fred Carter. He is recorded as having first served in ‘a theatre of war’ in France on 25th July 1915. The 8th Battalion was a volunteer battalion. In June 1916 it was moved to Carnoy, in the Somme sector to act as reserve in the forthcoming attack on the 1st July. On 19th July the battalion sustained heavy casualties in an unsuccessful attack at Delville Wood (known by the soldiers as Devil Wood) at Longueval. A report in the Suffolk and Essex Free Press on 23rd August 1916 listed Arthur as ‘wounded’. The First Battle of the Somme was a series of 12 battles over 141 days from 1st July 1916 to 18th November 1916. On 31st July 1917 the battalion saw action at the Battle of Pilckem, the start of the Third Battle of Yprés, more commonly known as ‘Passchendaele’. They suffered heavy losses and endured gas attacks and torrential rain with water waist high in the misnamed ‘Rose Trench’ where they began the battle. Arthur was killed in action on 31st July 1917, less than 2 years after Percy lost is life also in Belgium. 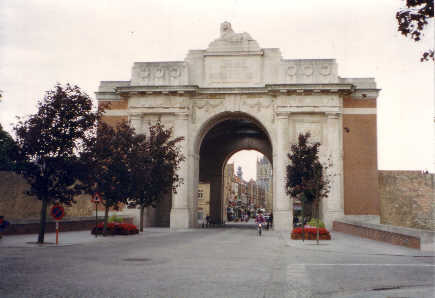 There is no known grave and Arthur is remembered on the Menin Gate Memorial, Yprés, Belgium. Arthur was awarded the 1914-15 Star, the British War Medal and Victory Medal.